William S. Wilson died of a heart attack on Monday, February 1, 2016. He didn't realize he was going to die of a heart attack. He thought he was dying of something else. I first met Bill by email in late 2003. His name was familiar to me but I couldn't quite place it. He reminded me about his Warhol article, "Prince of Boredom: The Repetitions and Passivities of Andy Warhol," (a title he hated) which I had seen referenced as a footnote in other essays written about Warhol and I ended up posting it online with his permission here. 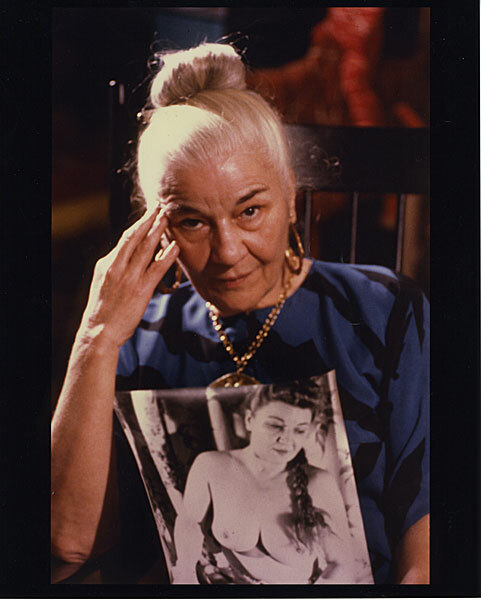 I also ended up posting an essay he sent me about his mother May Wilson, "Art is a Jealous Lover: May Wilson: 1905 - 1988" and of course his essay on Ray Johnson, "NY Correspondance School." I remember his gratitude at the time. It was still early days (pre-Facebook) for the net - and there wasn't a lot on the "world wide web" about Ray Johnson or Bill Wilson. If you googled Ray Johnson you got pages relating to, if I remember correctly, a baseball player and if you googled Bill Wilson you got pages about the founder of AA. (We used to joke about how "Bill Wilson" was often used as code by AA members to identify other AA members.) If you googled William S. Wilson, you got an L.A. critic. On I guess January 14, 1995, the police (who lie) asked Toby Spiselman and me to become executors, which I accepted. I promised to pay expenses for a funeral. Police hadn't even been in the house to look for a will: too much trouble, and maybe costing them fifty cents to do so. On Thursday, I think the 18th, we all entered the house, I for the 1st time. I have photographs: the police made the event seems like a hockey-game, continued by other means. In the middle of that night, having been lied to by the lawyer I had hired, and Ray's cousin having telephoned while we were in the house, establishing heirship of herself (who had known Ray) and 9 others (who had not known him), and X also lying, I knew that to continue the story of Ray's life, I would have to withdraw, and wrote an e-mail abrogating any executorship, and asking not to be communicated with about the Estate. Self-preservation. Bill educated me about Johnson but the person who really fascinated me was Bill. 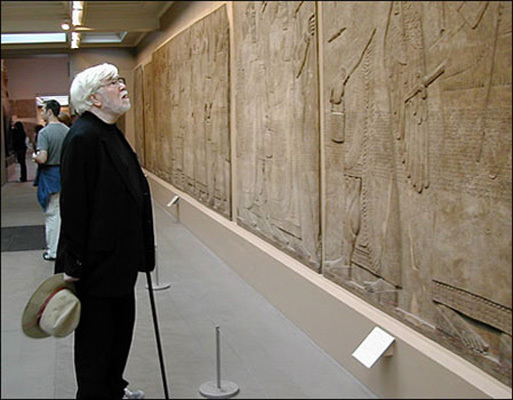 Despite already having had a stroke by the time we met (he was in his early 70s) he not only kept up a prodigious amount email correspondences, he also spent time attending exhibitions and panel discussions, travelling, writing essays, and hosting art and literary parties at his home (such as his party on April 7, 2012 to celebrate the birthdays of Billie Holiday and William Wordsworth!). How he managed to squeeze so much into his post-stroke lifetime is beyond me. At least that was the situation in 2007. His daughter Ara was a twin of her sister Kate. 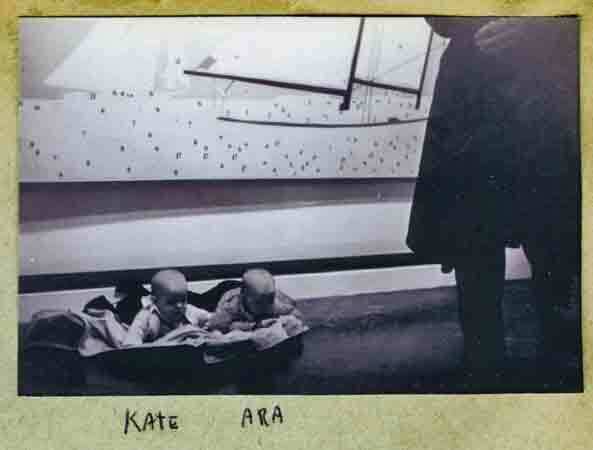 He sent me this photo of Kate and Ara at Andy Warhol's first exhibition at the Stable Gallery in November 1962. Bill also had a son, of course - Andrew. 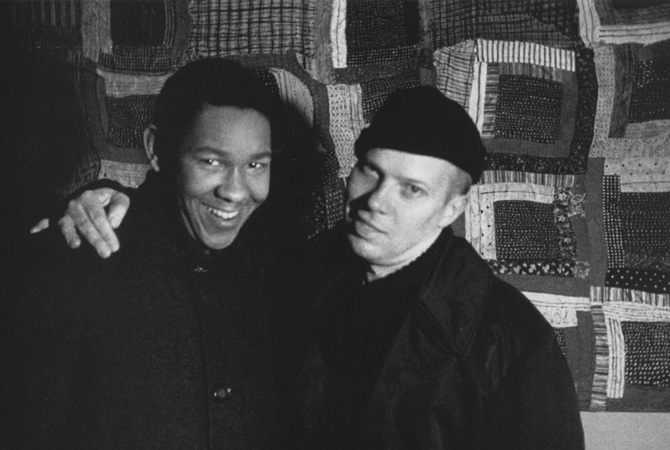 He was photographed with Ray Johnson in 1965 - a photograph which later became a postcard. On one of his visits to London I witnessed first hand how difficult it was for Bill to type with his shaky hands (a result of the stroke) and how much effort he put into each sentence he typed. Sometimes it was a matter of cutting and pasting rather than typing or of cc'ing people if the conversation you were having with him was relevant to a conversation he was having with somebody else. I was honoured to be a recipient of his emails, particularly given the effort he put into them. They formed such a regular part of my life that now that he is not here, it feels like part of me is not here as well. Something is definitely missing. In late 1920s, my grandfather, who had married a Covey from Punch Point, Sherwood, retired to live on stocks and bonds on Tilghman Island, in a new house he bought in an optimistically staked-out development, maybe 1928-29. Because of the crash no one else built on that land, nor did the developer top the dirt road with oyster shells. That first William Smith Wilson was loathed by island-wives at a time when hard liquor was not sold within at least five miles of Tilghman (people made their own beer). My grandfather was called “Judge Wilson” because he was a judge of women and whiskey. “Dr Jackson,” the druggist, was one of my grandfather’s many drinking buddies. Mrs. Jackson, mother of Charlotte Jackson (Howeth) and Walter, would have cursed his name, if she had cursed. Her pride was that she held paddle number 1 at any auction as far as Cordova and Trappe. In 1938, my uncle Roger Covey and his sister Helen Covey bought “our” house, far down the oyster-shell road which was precarious to drive on... When Aunt Helen died, my father, William Smith Wilson, Jr., as her executor, tried to sell her house, with some contents, but no one was interested in buying it, so there it sat, abandoned except for birds and deer eating the wild persimmons. For about two years, only wasps and raccoons seemed interested in its shelter, yet also, as I witnessed when I demolished a wall on the south side of the house, well over 100 black snakes. I moved from my sleeping-bag when a snake had crawled in with me -- to a bed of chill and dampness. One night the cook, who slaved over the hot stove in Harrison’s Inn, was taken down the road, beaten severely, and left for dead in a ditch. My father, searching for our cat, walked through a cornfield calling his cat, then stumbling onto the scene with the unusual policemen recovering a horribly beaten man from a road-side ditch. The black workers who lived in something like coops on Avalon, with a view of wild cats on the dump, were off the Island the next day. The Island became rigid and silent, no one willing to talk about what had happened, when nothing else so needed to be talked about. After that murderousness, and the silence of people whose silence was a confession of guilt – people I had thought were friends -- only Andy Bradshaw and Shaker Black felt welcome enough to sit in the porch, where they lied, shuffled their feet, and avoided my eyes. Truth left Tilghman Island, so natives began to sell out to Washingtonians, and then to move to Florida. After the horror, I spoke to “natives” only on practical matters, and didn’t bother meeting new people who took over stores. 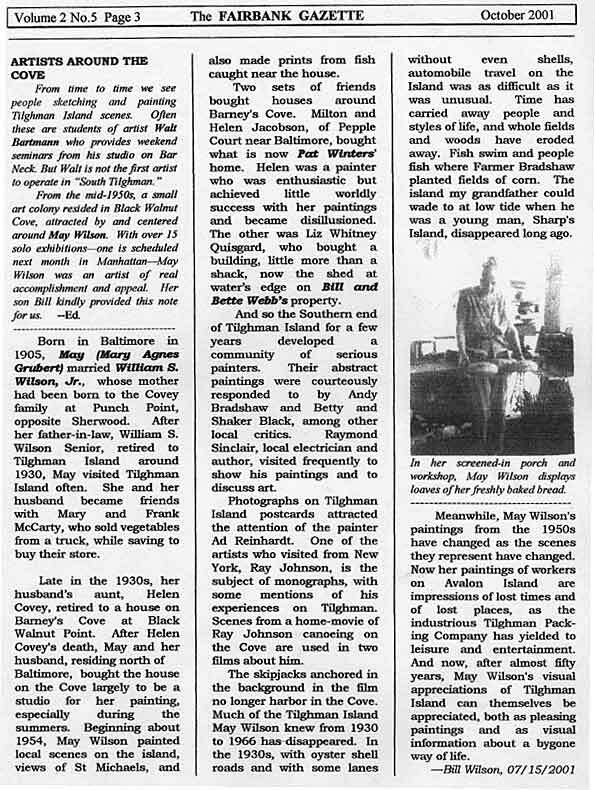 In 2001 he had contributed an essay about his mother, the artist May Wilson, to The Fairbank Gazette which gave more of the history of Tilghman. 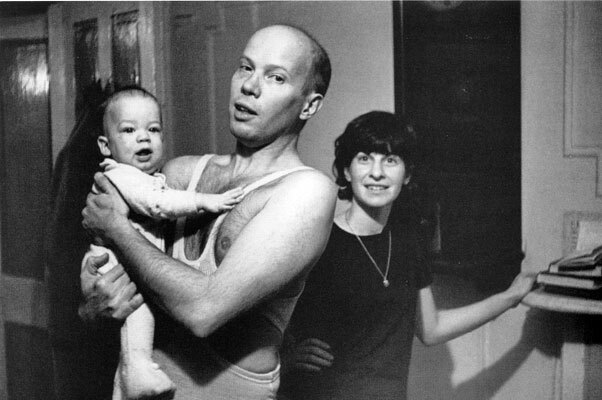 It was while May Wilson was staying on Tilghman Island in 1964 that she entered into a correspondence with David Bourdon who would later write the biography Warhol. The correspondence took place when Ray Johnson was in hospital with hepatitis. The catalyst for their correspondence was a request from Bourdon for some mail art and a complaint about the way that Bill and his wife Ann were chastising him about his "lump." 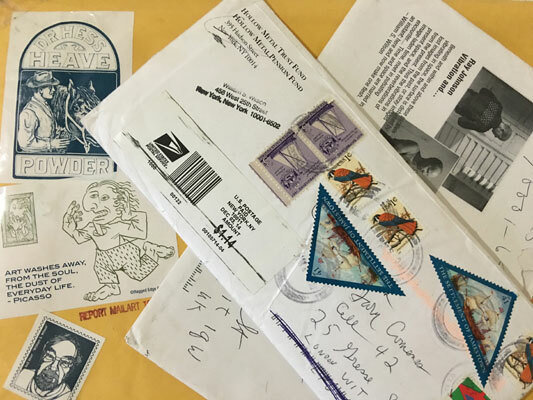 The correspondence begins on June 9, 1964 with May writing to David Bourdon about the mail art that he wanted from Ray. Ray had told her that she should send it to David and to charge him 29 cents for it. She continued "Then he [Ray] said that you were ruthlessly attacked by my son Bill Wilson and his wife Ann, that you do not deserve such an attack and that you would like me if you knew me. WHAT THE HELL IS HE TALKING ABOUT?" "Your son and his beautiful wife have ruthlessly attacked me at every encounter. The first time I met them, I did not like them and I wonder if there is any truth in the validity of first impressions. But I was lucky that time, because neither spoke to me. I merely thought they were rude. The second time I met Ann Wilson, I did not recognize her. She has a real Jekyll-Hyde personality, completely split asunder, but basically a warm, loving person who perhaps can only express her affection in the most brutal and terrifying manner. She is very much like Ann-Margret that way. But Bill Wilson is the most diabolical man I have ever met. Once at a party, where I suppose no one would speak to them, they entertained themselves by ridiculing my wardrobe form neck to fee. Bill Wilson thinks my pants are too tight. No one has ever voiced this opinion before. Considering my youthful figure, and taking into account the prevalent fashion, most people would think I dress quite conventionally. I do strive for conventionality. During a visit to their charming home, I was again attacked. BW: 'David Bourdon is wearing his tight pants again. What is that funny lump in your pants?' AW: 'Yes, David Bourdon, what is that funny lump?' Obviously, these are the kind of people who would ridicule hunchbacks and paraplegics, and I fear for the thalidomide generation and the mockery they will receive. On another occasion, Bill Wilson ridiculed my dull stories and my dull tone of voice and said I was the dullest person he knew, and Ann agreed. She said I was so dull, I was almost fascinating. Bill Wilson said that when Andy Warhol has a party he can't decide whether to invite me or three dead people. (Andy flatly denies this.)" May soothed his ego by reassuring him in a letter dated June 15, 1964: "I have seen other people in tight pants in their home and never heard any comments on the LUMPS, so you did not like them and they, obviously, did not like you, but I am sure this is not going to stop any of you from breathing and life will go on." On July 13, 1964, Bourdon wrote, "Oh Andy Warhol was here a week ago last Wednesday with Jerry Malanga and Sam Green. Andy said I had received more Ray Johnson mailings in a year than he had in all the time he has known Ray. And Sam Green said Ray always sends letters to 'unconnected people, like he sends all my things through Ann Wilson and she never bothers to give them to me.' They both appeared jealous and put out, and I had them put out. Gerry Malanga was very nice; he kept his mouth shut and wrote a poem." In a later letter, where the date is unclear, possibly September 16 or 18, 1964 - David writes "Ray signed himself out of the hospital Friday He is as pale and fat and mean and nasty as usual. He punched Dorothy Podber's jaw and has been very cruel to me me. People leave packages of food outside his door, as if he's some kind of alley cat in reverse." At the time of their correspondence David was researching an article on Ray Johnson and he ended up doing one on May as well. Bill planned on staying in London four or five days before proceeding to Venice. I arranged to meet him on arrival at Heathrow and I arrived about two hours early. I didn't want to take the risk of the flight arriving early and my not being there. I could barely contain my excitement at meeting this fascinating person that had sent so many charming and knowledgeable emails. So I got to the airport and waited. And waited. And waited. Guests waiting for arrivals at Heathrow have to wait in lobby of the terminal, outside of customs. The arriving passengers come through a curtain onto a runway marked off with dividers. People kept on coming out of the curtain after the flight had landed but where was Bill? I asked the passengers what flight they were coming off and they gave the same details as Bill's flight. Then the passengers stopped coming. Where was Bill? Had I somehow not recognized him when he departed the plane? Had something happened to him on the flight? I waited for what seemed an interminable time and then suddenly the curtains parted and there he was - being pushed in a wheelchair looking slightly dishevelled in a hat that looked straight out of Raiders of the Lost Ark and reaching out to me - "Gary! Gary!" I couldn't have asked for a better entrance. He exuded a "presence" that surpassed any of the other passengers. I think it was on that day when we had our first fight - certainly on that first visit. We were walking through Bloomsbury and got into an argument about something that I can't even remember and parted almost enemies. The next morning I got a call from him - let's let bygones be bygones and that's what we did. Again and again and again. We had quite a few arguments over the years, at least when we were together in person - over the silliest things - but they were quickly ignored and we went on as if nothing had happened. 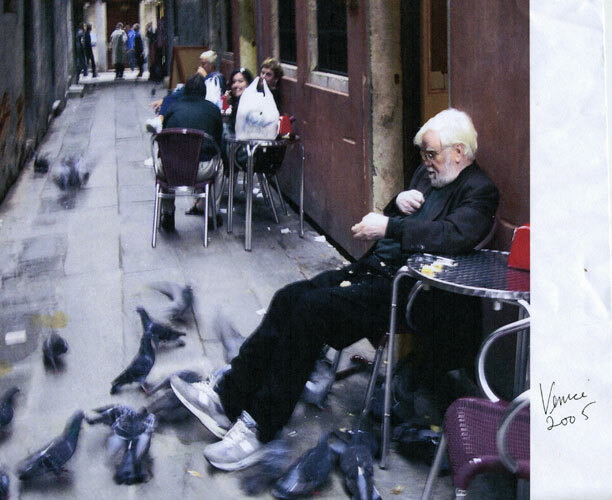 He returned from Venice on October 31 and flew back to the states on November 3, 2005. Our correspondence continued. One of the first emails I got from Bill after he returned to the states was on November 9, 2005. In the subject panel of the email was "Your assignment, should you choose to accept it,". The rest of the sentence was contained in the email, "is not to go to see the paintings, but to get to the postcard shop in order to buy five (5) copies of each postcard for Bill Wilson, acting as his agent, and morally bound to accept payment for them. Should the Queen be loitering with intent on the premises, or Prince Philip seem to be soliciting you to enter the WC, you are to decline to recognize their persons and their intentions toward you, focussing on your mission, which is to get those postcards through the censors to me. If your mission should fail, I will of course decline all knowledge of both mission and you. Any movie-rights to your story must be offered to Tom Cruise, who has taken an option." Below that was a cut and pasted paragraph of information about the exhibition of paintings he was referring to - "Canaletto in Venice" (11 November - 23 April 2006) at The Queen's Gallery, Buckingham Palace. He was so grateful for those postcards. It was such a small thing for me to do and his gratitude far outweighed my actions. Little things pleased him. We often corresponded about death. We both had medical conditions and we were both realistic about the possibility of death - except, of course when it came. 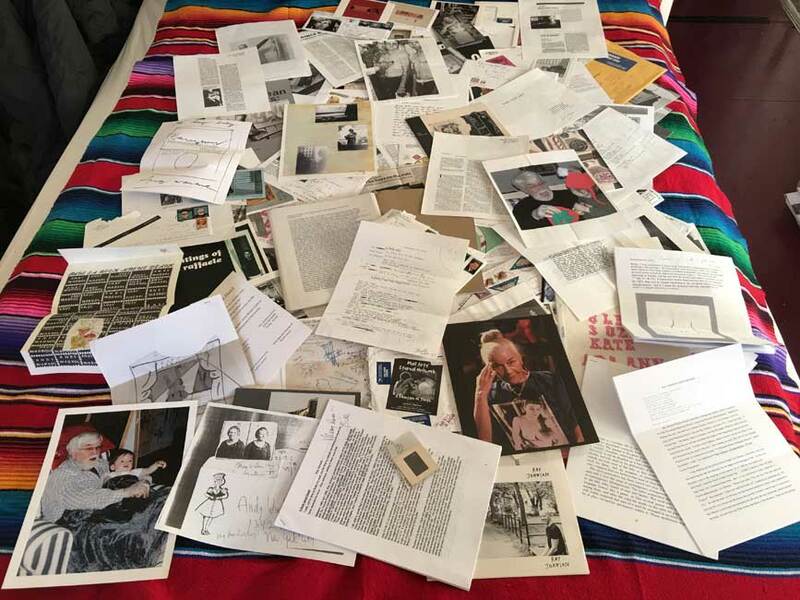 The fact that he was working on an interpretation of Ray Johnson's Book of Death in a considerable amount of emails added fuel to the existentialist fire.